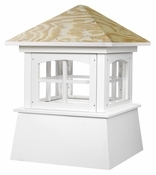 Adding style and aesthetics to your home, barn, garden shed, gazebo, or any other structure is easy with a cupola for sale at Millwork City. 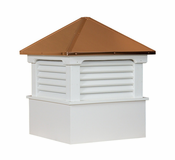 Our massive selection of roof cupolas contains dozens of styles, color combinations, and levels of detail. We’re committed to helping you find exactly what you need at a price you can afford; that’s where our lowest price guarantee comes in. 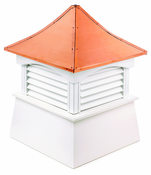 Whether you’re covering a large vent or fan on your rooftop or you just want to add charm and sophistication to your building’s exterior, a roof cupola from Millwork City can do just that. 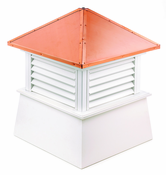 You’ll find louvered and windowed cupolas in our collection so you can find one that complements your structure. Intricately detailed cupolas and much more. 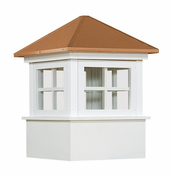 A roof cupola brings to mind castles, fine estates, and carriage houses. You’ll find the right look to add charm to your home or other building in our inventory. 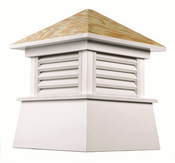 You can further customize our cedar, pine, or vinyl cupolas with one of our decorative round or spike finials, or a weather vane in a classic, traditional, patriotic, or whimsical style. 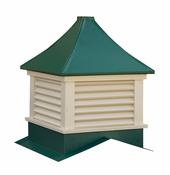 We carry cupolas in square or octagon shapes with a variety of caps, from bells to tall, curved or low, wide hip roofs. 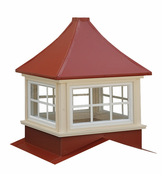 You’ll find a cupola for sale to suit small sheds or grand buildings, with heights in stock from 18" to 140". 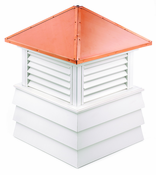 Looking for something simple that doesn't detract from your buildings exterior? 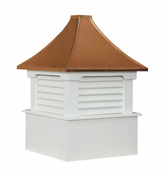 Check out our Dalton, Dover and Coventry cupolas. Want something that's tastefully elegant and brings old-world charm to contemporary buildings? 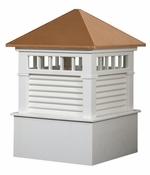 You'll love our Quincy, Salisbury and Winchester cupolas. Whether you’re a novice carpenter undertaking your first do-it-yourself project or you’re an established contractor working with a major building firm, you’ll find exactly what you need at Millwork City. 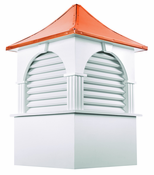 Each of the roof cupolas in our catalog is designed for easy installation and has been handpicked by our expert staff for its attractiveness, durability and reliability, so when you shop with us, you know you’re getting the best products at the best prices. At Millwork City, our customers keep coming back because they’re addicted to our extremely affordable prices, our fantastic customer service and our commitment to having the widest selection of wood and vinyl cupolas. We believe in building relationships with our customers, and we’re looking forward to working with you.